With Halloween just a few days away, we're finally in the home stretch, and more than likely, we're betting your annual Halloween office party is just around the bend too! For those of you still trying to decide on what to bring to the pot luck, why not make the food festive too? In today's article, we're highlighting our top ten favorite Halloween snacks from all over the internet. These tricky treats will certainly wow even the most ghoulish coworkers, just make sure you eat them before they eat you! It's never Halloween without a few creepy caramel apples to liven up the party, but these yummy will certainly earn a few screams from friends. This recipe comes from Erica of EricaSweetTooth.com, and it is certainly a winner. Rather than just feeding friends your standard caramel apple, grab a paring knife and some marshmallows for a treat that bites back. 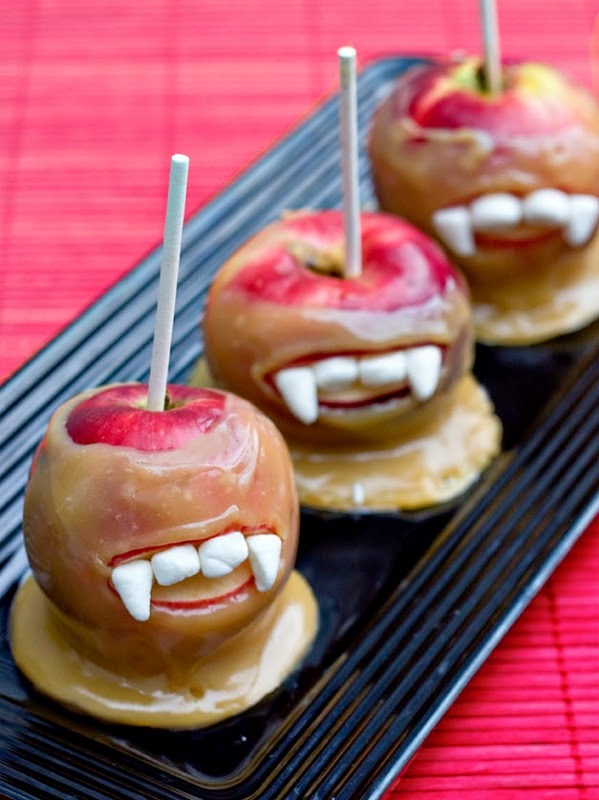 These vampire candy apples are adorable and delicious - always a win at the office! Set up a wax cookie sheet and stick each of your cleaned apples with one popsicle stick. You can use either store-bought caramel or your own caramel recipe (there is a great one on EricaSweetTooth.com). When the caramel is ready, submerge your apples (be sure you have a little caramel left to stick on the marshmallow teeth). When the caramel has dripped and dried, cut a wedge out of the apple for a mouth with a paring knife. Then, cut the marshmallows into teeth shapes. Finally, use the remaining caramel to stick the teeth to your vampire apple, and watch out! These graveyard cups are a cinch to make, and always worth the looks on your coworkers faces! Inspired by a recipe from MyRecipes.com, this version requires just a few ingredients. Though you do have to make an individual cup for every coworker, we guarantee you will be the hit of the party. These cups are great handheld treats for touring all the cool modern office cubicles decked out for Halloween. They're also excellent themed treats for watching reruns of The Walking Dead, just be sure no one is coming out of the graves! Whip up some of your instant or stovetop pudding (you could even just go ahead and buy chocolate pudding cups if you wanted to skip out on the cooking). The size of the cups determines how much pudding you will need. When the pudding is ready, pour it into the small plastic cups, making sure you have enough for your coworkers. Then, take your Oreos and remove the filling with a knife (heating up the filling in the microwave makes a great dip for dipping strawberries and other treats!) Take the Oreo cookie wafers and smash them up in a plastic bag until it resembles dirt. Use it to top the pudding cups. 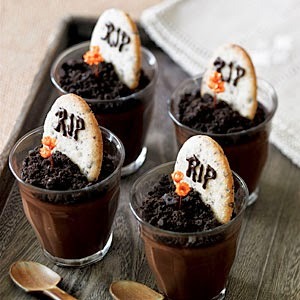 Finally, use the store-bought icing to write "RIP" on your lady fingers or milano cookies, then stuff them into the pudding cups to make the tombstones. Refrigerate and serve! 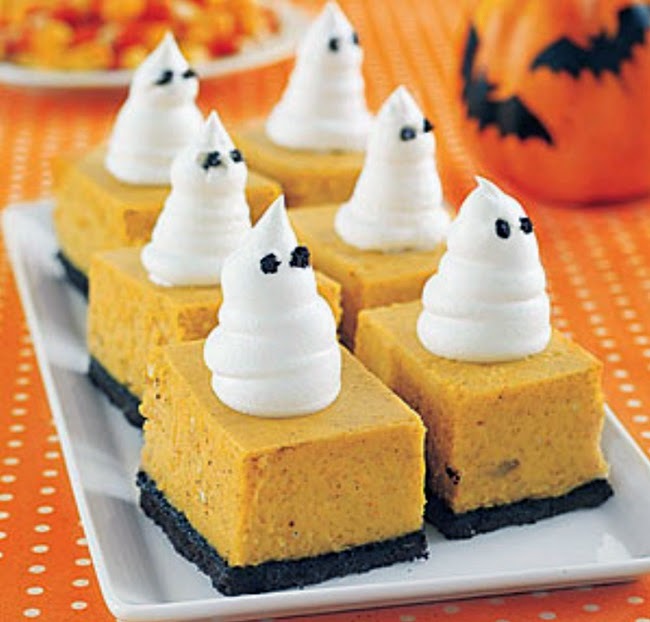 Probably the easiest recipe on our list, these little ghosts can go just about anywhere! Use them to top cupcakes, cocoa, coffee, or another yummy beverage that could benefit from a swirl of whipped cream. Just keep them in the freezer until you need them and put a sign up that lets coworkers know they are in there. They'll be the surprise that everyone has been looking for! Use a spray whipped cream to make swirls on a cold cookie sheet. Alternatively, you could use spoonable whipped cream or your own whipped cream recipe, and pour it into an icing tube to make your own swirls on a cookie sheet. Top each swirl with two mini chocolate chips for the eyes and freeze for a few hours until solid. Toss one on a cupcake or coffee mug for a delicious ghostly snack! 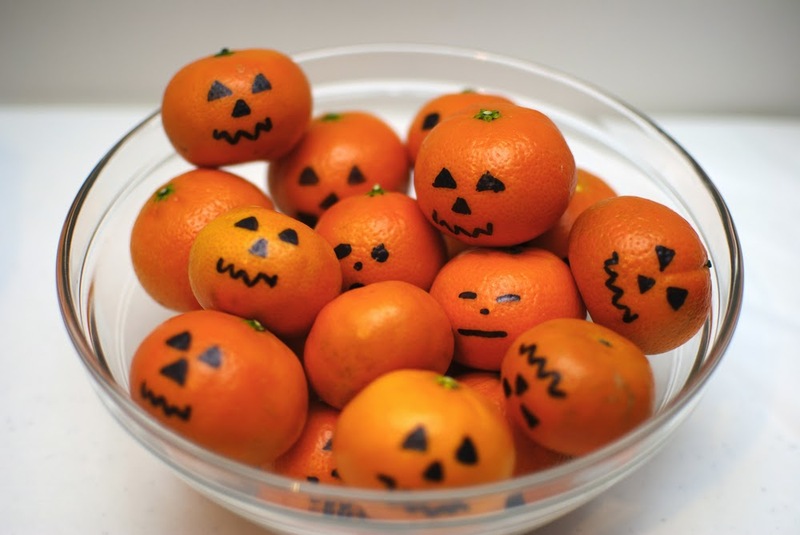 Another easy Halloween recipe, this one comes to us from Laura Himmelstein of Parenting.com. This treat can be a spiked spooky cocktail for adults, or a simple sweet recipe that children will love. Not everyone will know what it is, but it will certainly be a sweet treat everyone will appreciate! 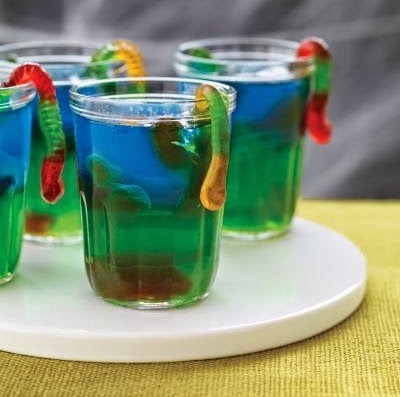 Fill your plastic cups halfway with the first kind of jello and drop in a gummy worm or two. Let it set in the refrigerator. After the first jello has set, drop in another two gummy worms and fill with your second jello flavor all the way up. Hang a gummy worm over the side of the cup as garnish, then pop 'em in the refrigerator to set again, and voila! You have a spooky cocktail your work friends will rave about! Need something savory to balance out all that sweet? This recipe is the perfect thing! 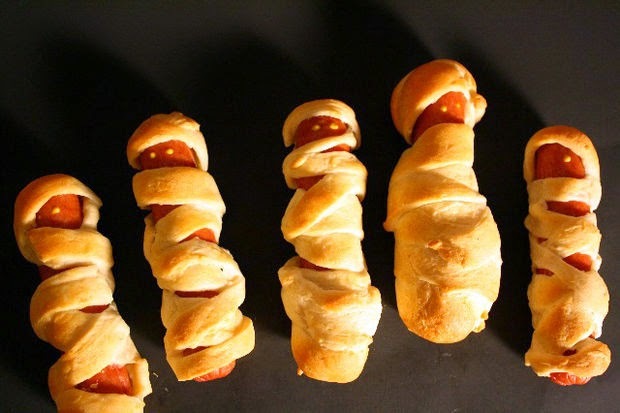 For anyone who loves pigs in a blanket, mummy dogs are an excellent savory Halloween snack from Scoochmaroo on Indestructibles.com. Set up shop on the office break room tables, and let guests get a scare from these delicious Halloween hotdogs! Unroll your biscuit dough and cut strips about one inch wide. Wrap your hotdogs in the biscuit dough strips. It's okay if it looks a little sloppy - these are mummies after all (just make sure you leave a space in the wrapping where the hotdog shows through to put eyes). Bake for around 12 minutes at 375 degrees, or until golden brown. After the dogs cool, put some pinpoint eyes with the mustard for a scary mummy dog snack! Watch out! 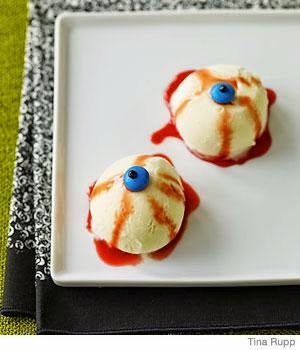 Or these jelly eyeballs will more than likely melt all over you, but they certainly make an eye-popping delicious dessert for a long night of partying at the office! Once again, this recipe also comes to us from Laura Himmelstein of Parenting.com (just like the Slimy Jello Suprise!) This ice cream recipe is perfect for those who like comfortable mesh chairs for their cooling effect in a warm office. Best of all, this recipe is so quick, you can easily serve it up right in the break room! Enjoy it in a bowl for a cool sweet treat! Freeze your cookie sheet so the ice cream doesn't melt so fast, and use a scooper to get a perfectly round eyeball of ice cream. Freeze them for about another 20 minutes. Drizzle the strawberry syrup all over the eyeballs, and top each eyeball with an M&M and a little black dot for the pupil. Serve it up in bowls and pretty soon your coworkers will be dining on the most delicious bloodshot eyeballs they've ever tasted! You can never go wrong with pizza at a party, but for the office shindig, you might have to call Human Services to make sure this pizza doesn't get a little handsy! This recipe from CuteFoodForKids.com is always a hit with both children and adults on Halloween. Surrounded by expensive office supplies and accessories, these easy-to-eat finger foods rarely make a mess, so you don't have to worry! Once you've found a finished cheese pizza (we don't care where you get it), go ahead and slice it up into strips to make the fingers. Once, that's done, cut up some red, orange, or green bell pepper slices into triangles to make the fingernails. Place your creepy pizza fingers on a plate and enjoy! Who in this world doesn't like nachos at a party? Yeah, we didn't think so. 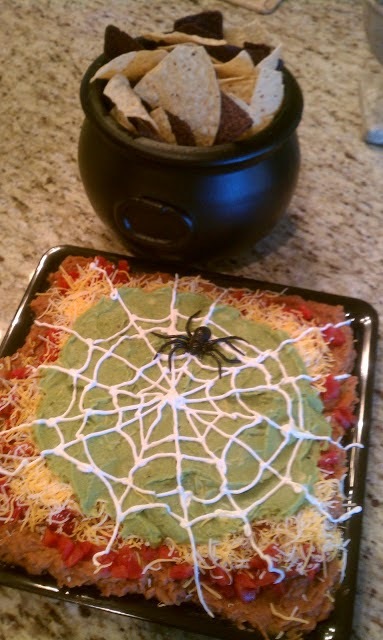 Everyone loves nachos, and on Halloween, this delicious messy dip from StylishlyEverAfter.com is always a hit. Set up some folding event chairs and everyone in the office will be in the break room eating up this savory Halloween snack! Mix up your refried beans with the mild taco seasoning on a tray as the first layer. Pour or sprinkle your shredded/melted nacho cheese as the second layer. Top the cheese layer with diced tomatoes and pico de gallo, or any other veggies you'd like, then smear guacamole in a circle on top of that! Using the sour cream in an icing bag, pipe out a spooky spiderweb all over the layered dip. Whip out your nachos and warm everything up in the oven for a few minutes, then top the dip with your plastic spider and wait for the screams! These alternative pumpkins will definitely keep your coworkers guessing, but for those in the office that want a healthier Halloween snack to save on their dental bills, this easy no-cook recipe is one of the best! Keep them on cool corner office desks for decoration that's both cute and yummy! Simply take your all natural citrus fruits and draw on some spooky faces and phrases to give your coworkers a good laugh! These witch hat cookies are both delicious, cute, and frightening! Three ingredients, and you can have an excellent Halloween appetizer as the final sweet treat to impress your coworkers. With little prep time and hardly any time spent decorating these cookies, they're the perfect last minute snack for the Halloween office party! Lay your fudge stripe cookies down so the chocolate covered bottoms face up. 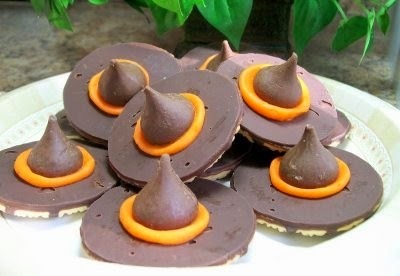 Put a dab of icing down in the center of each cookie to glue on the hershey pointed hats, and your treat is complete! We hope you've enjoyed these work-friendly Halloween treats. Have fun and stay safe from OfficeFurnitureDeals.com! A new office seating trend is taking the industry by storm! Segmented cushion chairs have become the premier choice of interior design teams and consumers alike. This popular new style offers excellent versatility for a wide variety of workplace applications. In today's post we'll showcase popular segmented cushion chairs and their benefits. Segmented cushion chairs offer a unique look that's appealing for modern, retro, and contemporary office applications. The sleek design saves space while offering a sophisticated feel that's sure to up the class factor of any office space. Chairs with the segmented cushions are typically available in both high and mid back variations to meet any users specific needs. 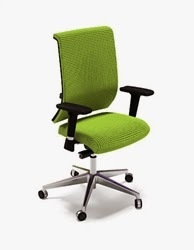 In 2014, segmented office chairs are being used for a variety of everyday applications. Most commonly, segmented cushion chairs are being used in professional boardroom applications to enhance corporate appeal while saving the space needed to maximize seating potential. 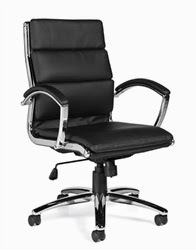 Additionally, these trend setting office chairs are also an excellent choice for executive offices. 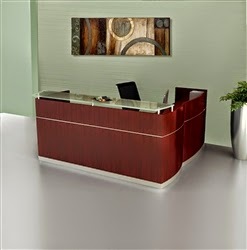 The upscale look, typically accented by polished frame features is sure to make any CEO's office shine! Don't be confused by the stunning good looks that segmented cushion chairs lack in terms of ergonomic benefits! The thick cushions provide ample support for those long days at the office. Most of the new chairs on the market featuring the segmented cushion look also come standard with ergonomic features that include pneumatic seat height adjustment, tilt tension, tilt lock, and reliably support users up to 200 pounds. The industries top brands are all falling in line with this popular seating trend. Top manufacturers like Ergo Contract Furniture, Eurotech, Woodstock Marketing, and Offices To Go are paving the way for a variety of new models that are sure to impress. The Status series office chair from Ergo Contract offers a high back design and polished features that are sure to boost corporate appeal. The Eurotech Ergohuman series features a hybrid segmented cushion look that's designed to enhance ergonomic qualities and keep users operating at high levels of efficiency. The Woodstock Marketing Hendrix models are highly credited with setting this trend in motion. The retro inspired segmented look showcased in the Hendrix series is truly a must see! Look for this booming movement to continue it's dominance through the remainder of 2014 and beyond. The versatility and trending style characteristics will soon have segmented cushion office chairs in a league of their own. Like with the mesh back seating boom, Segmented chairs are here to stay! This innovative new look is a great way to accent office areas while simultaneously improving ergonomic comfort. 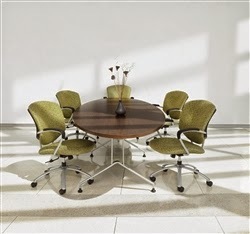 Modernize Your Meeting Area with An Elliptical Conference Table! Elliptical conference room tables are in! This booming design trend has gained major traction in 2014 and the industries best manufacturers are taking note. In today's post we'll highlight the benefits of elliptical conference room tables and several of the hottest models on the market today. Enjoy! Elliptical conference room tables feature curved sides that come to a point at both ends. The sleek design helps to save space while maximizing seating potential. Elliptical top tables offer a blend of modern and contemporary style characteristics that are sure to impress valued office guests. Elliptical tables typically feature metal bases that add the extra element of industrial appeal. Brands like Global Total Office and Lesro Industries are offering stylish elliptical conference tables for sale that won't break your office makeover budgets. Global is now offering there popular Alba table line with elliptical top options in lengths up to thirty feet. The Lesro Industries Mystic collection includes best selling elliptical conference tables available in a choice of 6 attractive finish options to meet the decor needs of any space. Look for additional brands like Mayline, OFM, and more to be hitting the market with elliptical top tables in the near future! These days it's all about meeting efficiency! Luckily, the top manufacturers of elliptical conference room tables have kept this key principle in mind. Both Lesro and Global Total Office offer factory installed power modules that allow for plug and play meeting area performance. These simple to spec solutions can be outfitted with a wide variety of input options to meet your boardroom technology needs. Elliptical conference room tables are surprisingly affordable. The narrow tops require less overall materials than competitive shapes like racetrack and rectangular. That being said, table size will be the greatest factor in determining the price of an elliptical conference room table. Global offers 5' models for as low as $456.99 while Lesro Mystic series tables with elliptical tops start at approximately $799.00. Adding power modules will add to the purchase price of your new table but should be highly considered by all businesses. They are definitely worth the investment! Global's 8' Alba table is an excellent choice for medium sized boardrooms. Priced at just $566.99 this elliptical table is an excellent value. Available in 9 laminate color options, this Alba table allows users to let there design skills shine. Two base finish options are also available to compliment your table surface choice. The Lesro S1896K4 Mystic office boardroom table also features an 8' top. All 6 of the available finish options ship quickly for those in need of a new table in a hurry! At a price of $799.70 the S1896K4 is also an excellent value. This trending boardroom solution features a durable metal base and stylish 2 level top design that's sure to make any meeting area pop! Choose Global Total Office For Your GSA Furniture Needs! Government entities required to purchase GSA approved furniture are often left at a disadvantage of brands and products to shop for their office makeover projects. Luckily, brands like Global Total Office offer the desks, tables, reception stations, seating, and storage solutions needed to boost decor while keeping shoppers under budget. This world renowned manufacturer is the premier choice for high quality GSA furnishings and in today's post we'll show you why! Global Total Office offers a wide range of GSA approved furniture collections for open floor plan layouts and individual work spaces. Lines like Zira provide excellent modular benefits that will allow users to transform boring office areas into works of art. Zira's customizable features include laminate color options, metal finish options, handle pulls, and much more. Both the open desking and executive workstations Global offers through the Zira line are truly impressive. In addition to the popular Zira collection, lines like Adaptabilities, eO plus, and Princeton also provide impressive appeal for modular furniture lovers looking to purchase on active GSA schedule. Leave no doubt, Global Total Office is the absolute best source for GSA approved office tables. With a wide range of accent tables, conference room tables, and training area tables available, finding a solution to meet your specific needs is easier than ever. Accent table collections like the Wind Linear line offer contemporary style characteristics that will take your guest waiting area to the next level. New conference room tables from collections like Alba and Zira boast a variety of high tech power options designed to streamline meeting efficiency. GSA approved training tables from lines like Global's Bungee collection offer space saving flip top designs, mobilized bases, and a wide range of size and finish options to choose from. It's not secret that selection of GSA approved reception desks for sale on the market it is pretty slim! However, those who check out Global's offering will have no need to shop further. With a variety of stunning L shaped, U shaped, and rectangular stations available, Global is the best option for your waiting area. Available for single and multi user applications, Global's reception stations are extremely versatile. All of the customizable models are available with finish, handle pull, storage, and size options to compliment your office personality. Global GSA approved seating solutions are the best in the business. Even in the one office related area where market competition can be widely found for GSA products, Global has found themselves ahead of the curve. 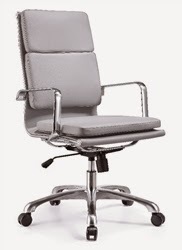 This year alone Global has introduced cutting edge ergonomic chairs like the Spree, Arti, and G20. 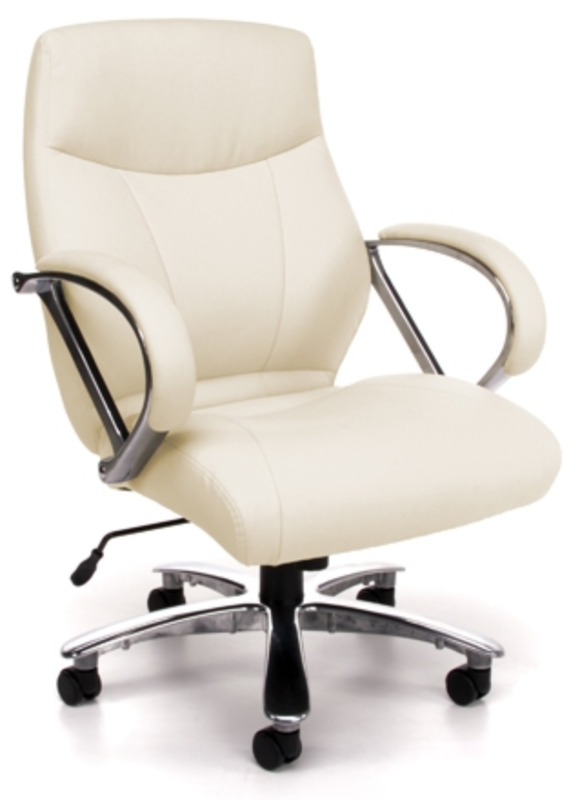 These user friendly office chairs will have you sitting in comfort even through the toughest days at work. 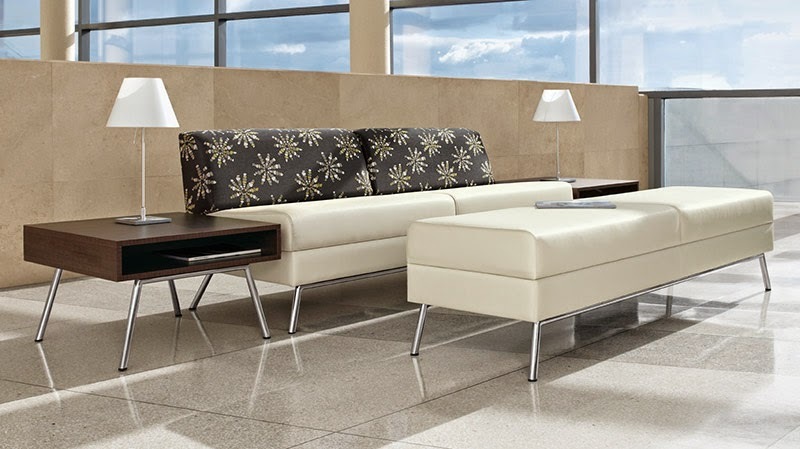 Global's line of GSA approved lounge and reception seating includes modular beam seating, leather lounge furniture, and wood guest chairs available in a variety of attractive finish options. From the classroom to the cafeteria, Global provides the seating needed to professionally accommodate any educational facilities needs to perfection. Well organized work environments operate at higher levels of productivity. It's a fact! That being said, Global Total Office provides the user friendly office storage solutions needed to keep your respective office areas well organized. From lateral and vertical filing cabinets to mobile file pedestals and metal storage cabinets this is one manufacturer that does it all! Global's offering of office filing and storage solutions includes thousands of options available on active GSA schedules. These stylish storage options are available in a variety of finish options and sizes to meet the organizing needs of any professional workspace. Rest assured, not all GSA filing cabinets are created equal and Global stands a cut above the competition! Looking for that special something to stand out in your workplace? Never fear! 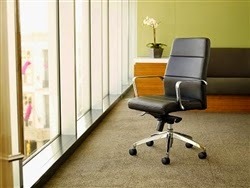 Whether you work at home or in an office building, white office chairs will command attention wherever you place them. In today's article, we're highlighting five stunning white office chairs to stand out in your office. But it's not all about looks; these chairs have ergonomic features to keep you comfortable as well as trendy! Bursting with contemporary style, it's hard to deny the appeal of this white ribbed back office chair from Offices To Go. 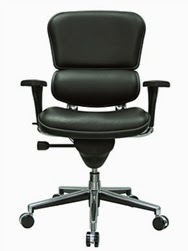 Perfect for use in conference rooms, cubicles, or desks, this chair makes it a snap to increase workplace versatility. Offered at an affordable price, the 11730-BL28 will not break your bank, and with great ergonomic features like removable chrome arms and a pneumatic seat height adjustment, this seat can adapt to the changing needs of the workplace faster than ever! Relatively new on the scene, the G20 6008 Cloud Series office chair by Global is one way to make sure your office will stand out from the crowd. For those that don't like leather or fabric upholstery, or spend all day in a warm office, this white mesh desk chair can provide a cooling breeze! The mesh back allows air flow to pass through, leaving users refreshed and relaxed. As if that weren't enough, this chair adjusts to body weight automatically, and is accompanied by a smooth tilting mechanism and lumbar supports for the ultimate in workplace comfort. Ready to get your zen on? 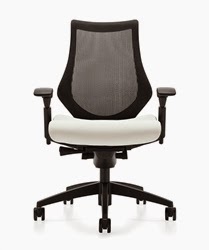 The Chakra-white-grey is comes from one of the top trending ergonomic chair lines on the market today. This wonder from Eurotech Seating offers an open zoomorphic structure, for a seating experience that feels lighter than air. Seven independently moving cushions support the body's pressure points and chakra centers, leaving users comfortable and at peace! A knee tilt relieves pressure on the body, promoting smoother blood flow and increasing workplace health for anyone who uses it. Of course, the vibrant white upholstery is always a plus! 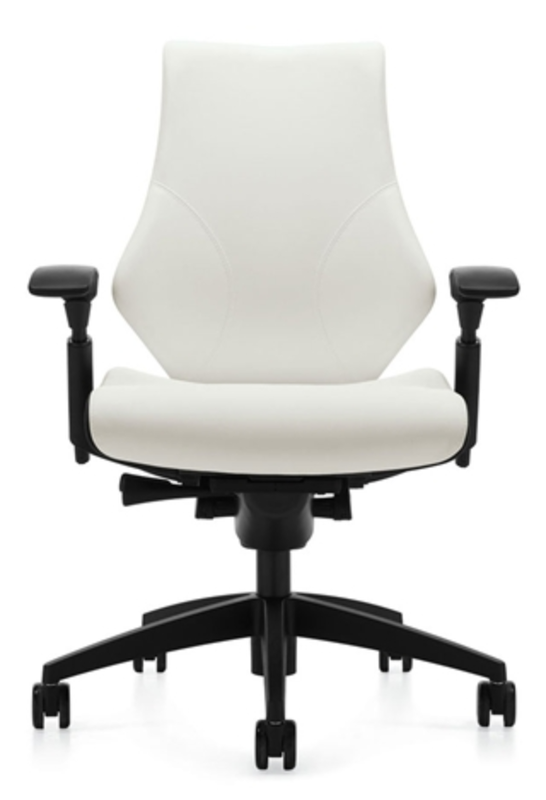 A long time favorite, its no wonder the 811-LX Avenger Series Chair by OFM made it on our list of stunning white office chairs. 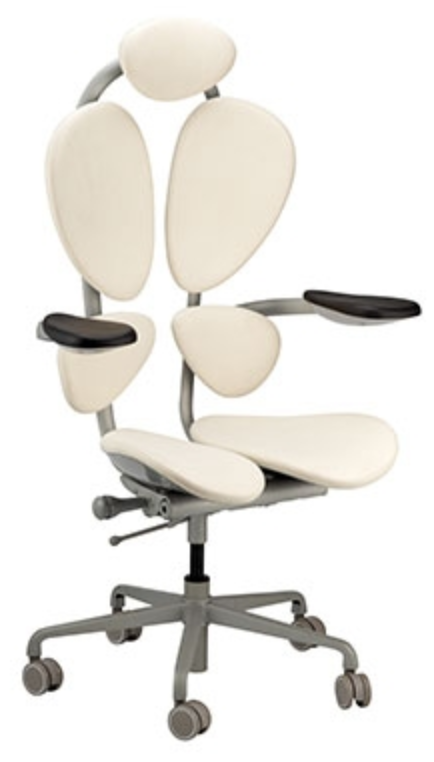 With curved arms and a futuristic physique, this elegant office chair certainly turns heads in the right direction! In addition to a supple leather appeal, this chair also has plenty of ergonomic assets. Thickly padded cushions, 360 degree swivel, a gas lift, and full body support leave users comfortable all day long. Add it to a conference room or executive office for maximum star power. A Greenguard certification is just icing on the cake. 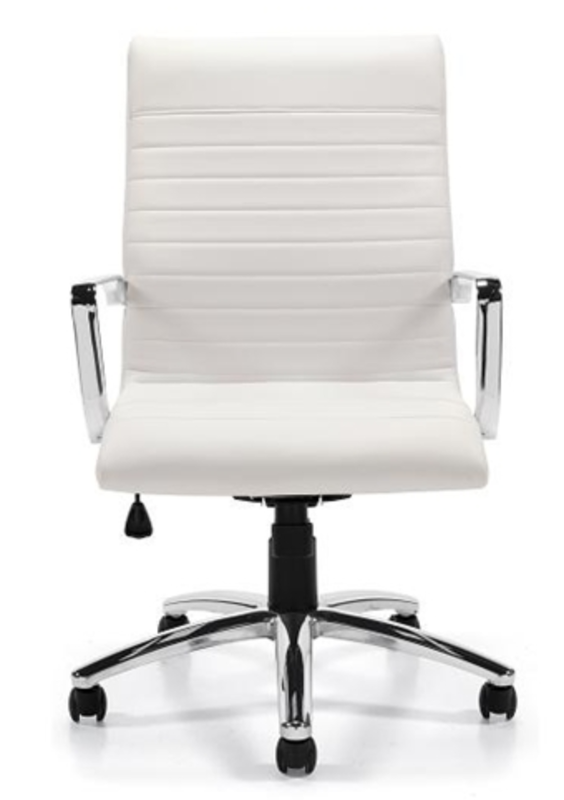 Finally, we leave you with the new Spree 6041 Vinyl Syncro-Titler Chair by Global to make your heart swoon. With a spotless white upholstery, this new ergonomic chair provides the stark contrast to stand out in just about any office. But Global knows that looks aren't everything. This chair also includes plenty of ergonomic features. 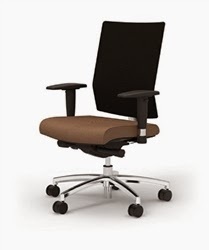 A wrapping lumbar support, seat slides, reclining back and arms, tilt tension control, and unique ergonomic shape keep users relaxed during those long work days. Don't miss out on the trending style of the Spree chair! New Mayline Medina Desk Configurations Available Now! The Mayline Medina casegoods collection has become an instant hit. The perfect combination of modern and traditional style characteristics have united to form one of the best new new office furniture lines of 2014. This month, Mayline released an abundance of hot new desk configurations from the Medina collection. In today's post, we'll showcase the awesome new layouts and their components. Enjoy! First up, the MNT32 layout priced at $1584.99. 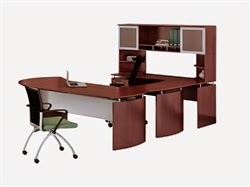 This U shaped desking configuration features a left hand return the connects the 72" front desk and matching rear wall credenza. The MNT32 includes a stylish accent hutch with glass doors as well as two credenza organizers for paperwork and office stationary. The rear wall credenza unit is also outfitted with a full size box box file pedestal for further organizing needs. This executive furniture set boasts 9 pieces in total at price point any budget minded shopper will appreciate. Second on the list of new Medina desk configurations is the MNT16. 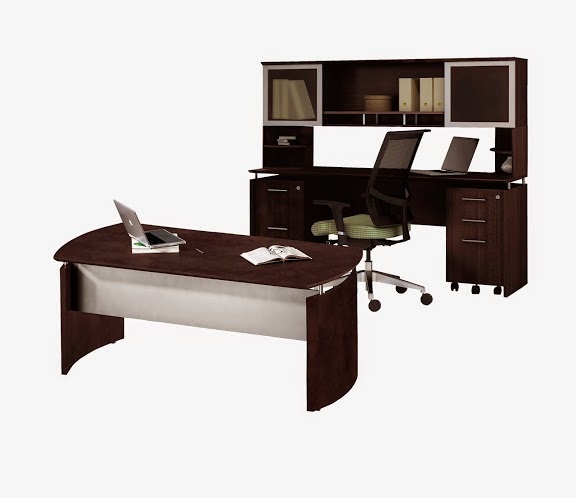 This 6 piece package includes a 72" wide desk with right curved extension and left pedestal extension. With plenty of worksurface space available, the MNT16 is an excellent choice for both home and professional executive office applications. In addition to the main workstation, the MNT16 includes an MVLC model low wall cabinet with glass and laminate doors as well as a 2 drawer lateral file cabinet that locks for document security. At a price of $1729.99, the MNT16 is an excellent value. 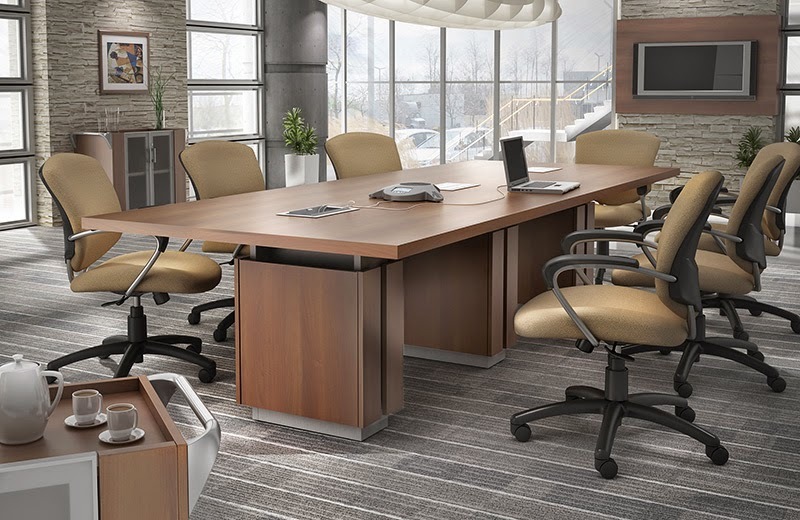 The MNT10 Medina office furniture suite is great for smaller executive office areas looking to capitalize on storage without sacrificing high end appeal. This $1543.99 package boasts a 72" main desk with corner extensions showcased on both sides as well as a versatile wall storage layout that's sure to impress your valued clientele. The VLC model center cabinet can be used individually or with the two 1/4 round bookcases included in the set. The modular benefits of the Medina collection make the MNT10 an excellent option for those looking to expand their furniture layout in the future without the extended cost of purchasing a whole new furniture set. 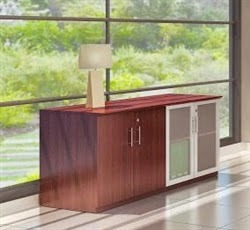 Simply add the return, hutch, and credenza to the MNT10 typical when needed and enjoy the savings! Simple, stylish, and cool! 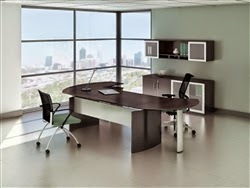 The MNT2 Medina desk layout is the perfect starter configuration for up and coming executives. This 63" desk with right hand corner extension and left handed pedestal extension provides plenty of space to compute and operate throughout the work day. A matching center desk drawer is included at a price of $883.99 and offers plenty of storage for office stationary. The desk drawer can be removed to add an articulating keyboard tray if you're looking to add an ergonomic touch. The MNT2 is available in mahogany, mocha, and gray steel laminate finish options to meet your decor needs. Last but certainly not least, the MNT38 Mayline Medina office furniture configuration provides the high end executive appeal needed to showcase your work environment without breaking the makeover budget. This 7 piece package includes a rectangular Medina desk with curved ends and metal modesty panel along with a matching rear wall credenza and overhead storage hutch with glass doors. The mobile file pedestals can be easily moved out when needed and slid back under the credenza for a clean and sophisticated look. Credenza organizers are also include to help users keep track of important paperwork on a day to day basis. This package is a real head turner and an excellent buy! Working in a cubicle doesn't have to be uncomfortable! In today's article we'll showcase 5 of the industries best desk chairs that will have you working at your highest levels of productivity and efficiency. With top seating solutions from brands like Global Total Office, Eurotech, and Offices To Go, life in the cube can get a whole lot better! 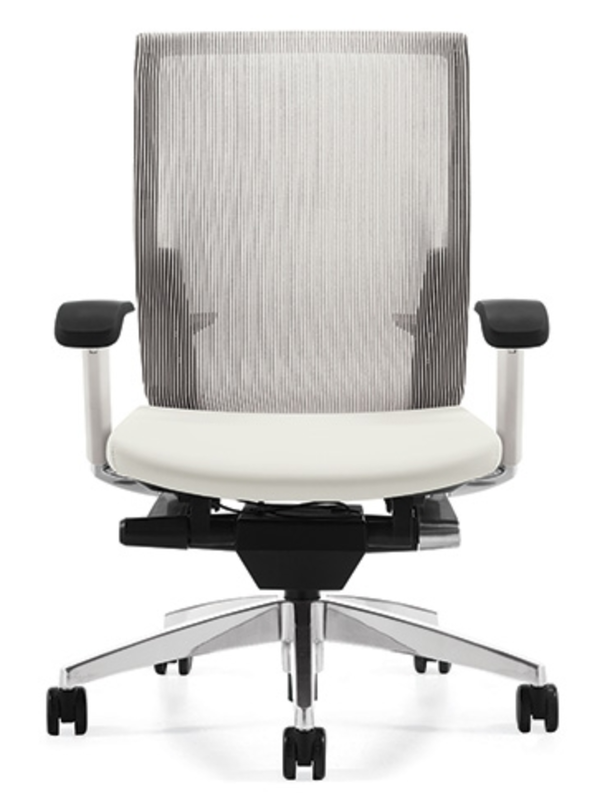 First up, the all new Spree series mesh back chair from Global Total Office. This innovative swivel chair offers the cutting edge ergonomic features needed for those long days at the office. The 6040 Spree chair boasts a sophisticated back that helps users avoid restricting upper body movement, thus allowing the user to easily access space all around their work station. The lumbar area wraps around the users waist to provide a secure feeling and excellent support that can't be denied. Priced at $386.99, spree chairs are an excellent office investment. In addition to functional features that will improve your work day, the Spree chair is also available in a wide range of color options that will help you showcase your individual style! Next up, the Eurotech Bodyflex chair. 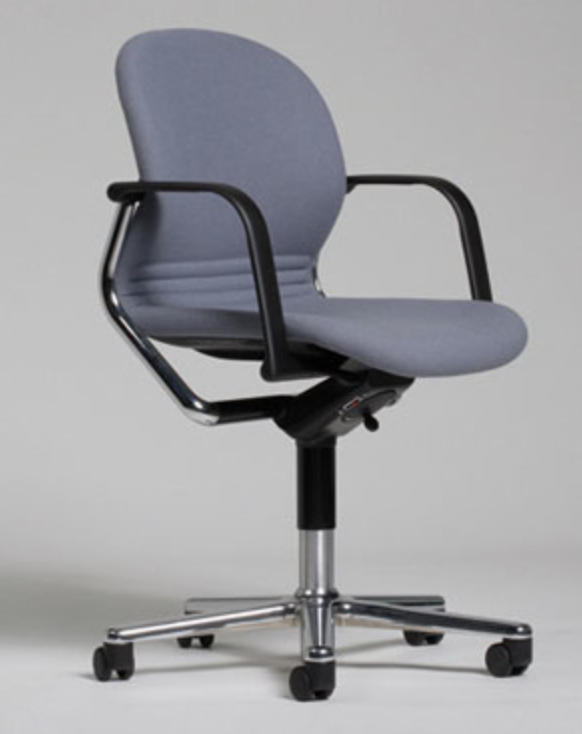 The Bodyflex chair will have you sitting at the highest level of workplace comfort in no time! This high end ergonomic chair boasts modern style in abundance. The self inclined mechanism balances body weight resulting in a smooth yet effortless sit you can depend on. Standard ergonomic features like tilt tension control, center tilt, and a waterfall seat edge make the Bodyflex an excellent value at only $366.00. Choose from a variety of unique color options to compliment the modern black back. Third on our list of desk chairs designed to improve your day in the cubicle is the super cool 10904B chair by Offices To Go. This $198.99 chair is truly the best buy on the market. Standard with adjustable arms, pneumatic seat height adjustment, adjustable lumbar support, and much more, it's hard to deny what an excellent value the 10904B is. The attractive polished base and easy to use mechanism have made this seating solution one of the most popular models available on the market in 2014. Rest assured, there is no better chair for the money! Cherryman released there new iDesk seating line just 2 weeks ago, and chairs like the Ambarella have already become a top choice of industry professionals. These ergonomic wonders boast a wide range of user friendly ergonomic features designed for optimal support. The Ambarella offers contemporary metal accents that combine with a breathable mesh back and extra padded contoured seat to form one of the best new desk chairs to hit the market in recent years. 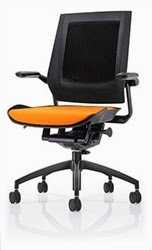 Look for these cubicle friendly task chairs priced starting at only $214 to continue there market dominance in 2015 and beyond. Last but certainly not least, if you're looking to take your cubicle comfort and workplace productivity to the next level, look no further than the Mayline Commute chair. A remarkable simple to spec solution for today's office environment, the Mayline Commute chair fits users from small to tall by leveraging the easy to use seat slider. 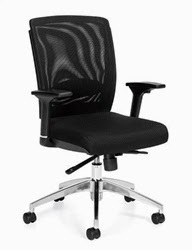 The new Commute chair is available in both mesh back and fully upholstered models with a choice of black or chrome base. This modern swivel chair is revolutionizing the seating industry in a major way. The sleek design saves space with the standard ergonomic features are more than enough to make your sitting experience a real pleasure. All Commute models are standard with a synchro-tilt mechanism and 2 1/4" travel seat slider, tilt tension, and tilt lock starting at $311.99. If you're looking to create a stylish office space, Mayline furniture is always a great choice! This innovative manufacturer is always pushing the limits and raising the industry bar. In today's post we'll highlight the top 5 best selling Mayline casegoods collections of the year. Enjoy! 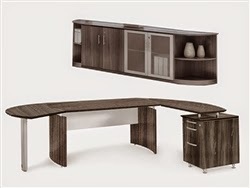 The recent release of the Mayline Medina Collection sent shock waves through the office furniture community. This affordable, stylish, and downright cool line of office furniture has quickly become Mayline's big winner of 2014. Medina includes a wide range of executive office desks as well as boardroom tables and versatile office storage solutions available in three stylish finish options. Look for Medina to continue it's dominance in 2015 and beyond! The Mayline e5 collection was recently expanded to include in stock typicals that work great in both home and business applications. This line of cutting edge modern desking features a blend of metal, laminate, and glass tones that set it apart from all other collections on the market. Mayline's e5 series is available in a wide range of finish options and features modular benefits that make it a great fit for any work environment. If you want to keep you space inline with the latest design trends, choose e5 from Mayline! The Napoli collection always finds itself atop the office furniture world. Year after year Napoli casegoods are called upon for high end office applications. The perfect blend of modern and traditional style characteristics makes Napoli one of the most versatile casegoods options on the market. 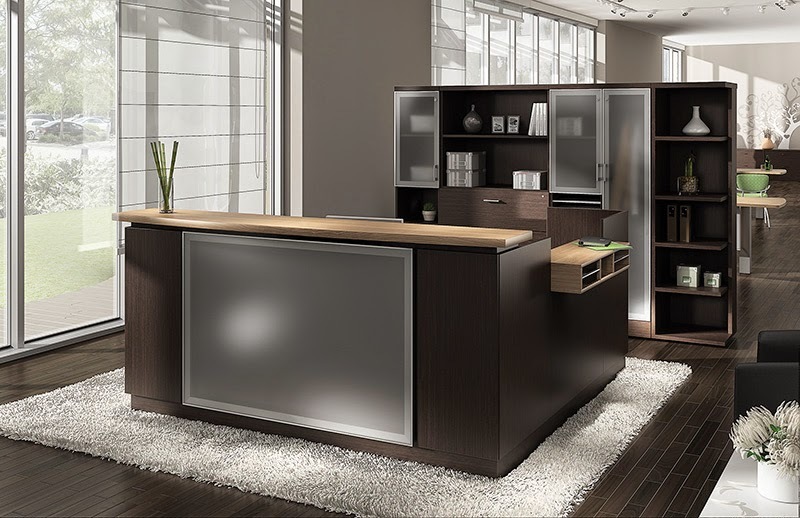 With a wide array of stunning executive desks as well as conference room tables and storage cabinets, Napoli is ready to outfit any area of your business with a luxurious look that's sure to earn ample design compliments. Three attractive finish options are offered to meet your specific decor taste. Mayline's most affordable line of casegoods, the Brighton collection is full service collection of desks, reception stations, conference tables, and more. Those looking to outfit their professional business areas on a budget will love the look and quality of the Brighton collection. Both mocha and cherry finish options have been incredibly popular in 2014 and Brighton offers both! You can't go wrong with the budget friendly solutions showcased in the Brighton collection. 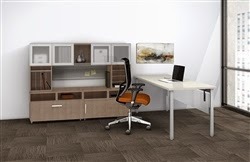 A long time favorite of interior design teams and industry professionals alike, the Mayline Aberdeen Collection offers a distinctive look that works well in professional work environments. This extensive collection of laminate desks, reception area stations, and boardroom tables is available in maple, cherry, and mocha finish options. Aberdeen features simple yet sophisticated curves accented by glass hutch doors and attractive handle pulls. Boardroom tables from the Aberdeen line are available with factory installed power modules to keep your meetings running more effectively and efficiently. With features like this, it's no wonder why Aberdeen has found itself atop Mayline's best list in 2014. The Mayline Medina collection has become and instant hit! This line of modern office desks, conference tables, and office storage solutions is sure to kick any workspace up a notch. In today's post we'll take a in depth look at Mayline's hottest new line and it's products. Enjoy! The Mayline Medina Collection offers the perfect combination of modern and traditional style characteristics. Medina blends laminate work surfaces with metal accents to form one of the most well rounded collections to hit the market since it's predecessor, Napoli. If you're going for wow factor with your office makeover, Medina is a must consider! Medina furniture is available in three attractive finish options. The mocha finish offers a darker look that shows minimal wear and provides a luxurious feel. The mahogany finish is preferred for traditionally inspired projects looking for a hint of the modern world. This classic finish is sure to speak volumes to a wide range of office guests. Last but not least, the gray steel wood laminate finish is what's put Medina on the map! The most popular of the three options, gray steel has started a whole new industry movement towards gray wood tones. This hot finish is sure to wow your valued clientele and looks great in contemporary spaces striving for that cutting edge feel. Medina series office desks are sold individually and in configurations to suit the needs of any office makeover project. Mayline's desks from the Medina collection can easily be used in both home and business applications. The executive look is highlighted by curved leg panels and sophisticated lines that look truly luxurious. Desks are highlighted by metal modesty panels and risers that blend your choice of laminate finish to perfection. This year powered conference tables have become the industry standard! Mayline made this emerging trend a top priority when creating the Medina conference table line. These 8' and 10' tables can be outfitted with factory installed power modules that include 3 prong outlets and data inputs that are sure to streamline your meetings. Not only do Medina series conference tables look great, they are effective too! These boardroom solutions will improve your corporate decor while simultaneously boosting your meeting efficiency. 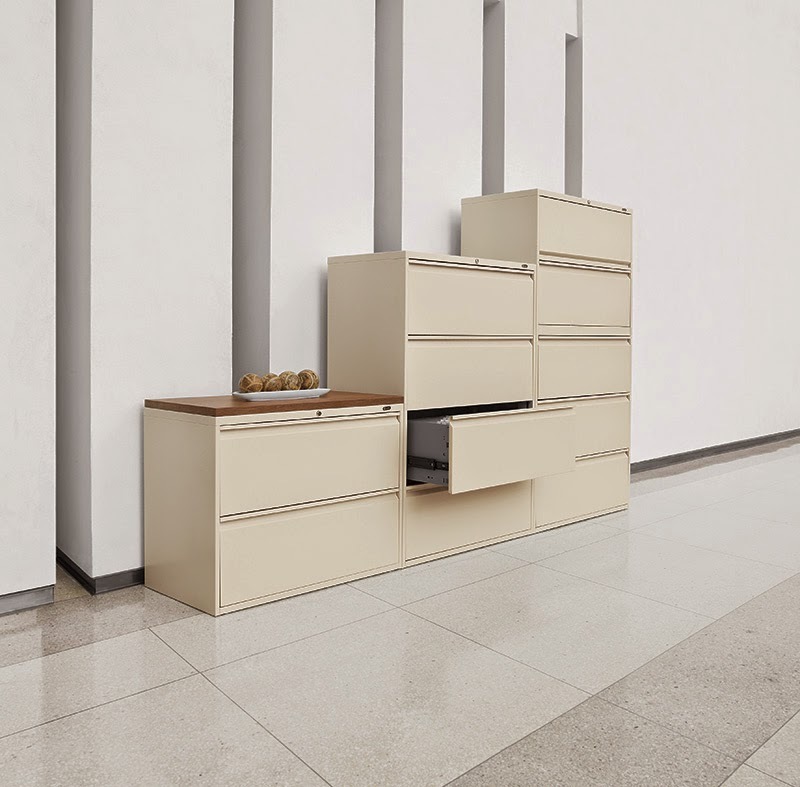 No full service office furniture line is complete without the storage solutions needed to keep users organized. That being said, the Mayline Medina collection includes a wide range of versatile wall cabinets with glass and laminate doors along with mobile file pedestals that work in harmony alongside desks. Medina desks are also available with overhead hutch units that can be wall mounted or used with legs to situate on credenza work surfaces. Medina bookcases make an excellent accent addition to home, conference room, and executive office environments. Whether you're storing books, stationary, or important literature, Medina has a solution for you! It's no secret: Retro is in! Everywhere, office interior designers are turning back the pages of time to bring old-school style to the modern office. For anyone who wants to outfit their workplace in a makeover with vintage style chairs and furniture, this article is definitely for you. 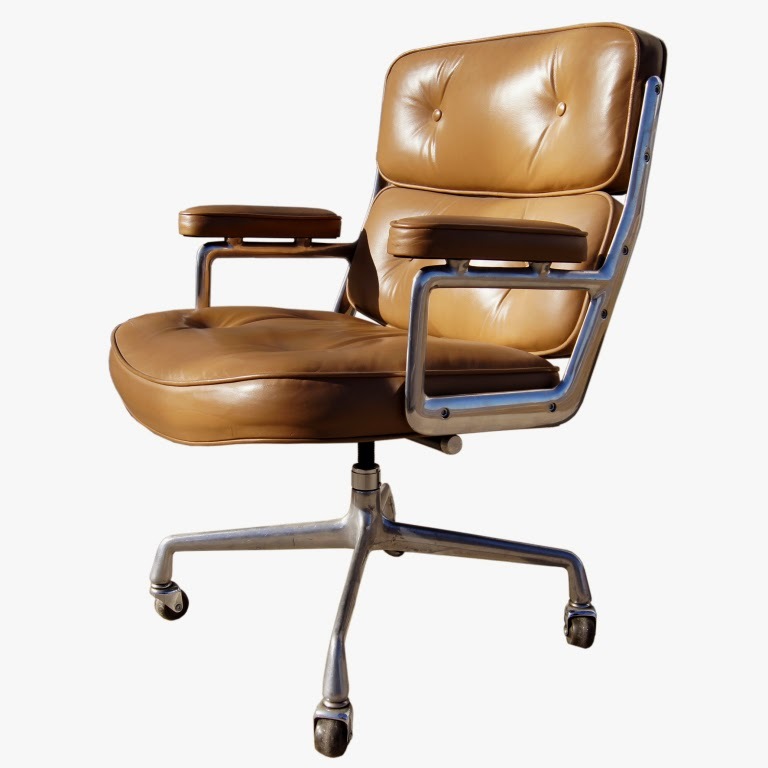 Here, we're showcasing the top office chairs from every era, so you can choose a favorite and get your retro office rolling. Enjoy! Many of us think of the 40s as our grandparents' time, but for classy modern executives, nothing says "elegance" like a chair modeled after the ones from 1940! 40s style retro has been making a huge comeback in recent years, especially in home office design. 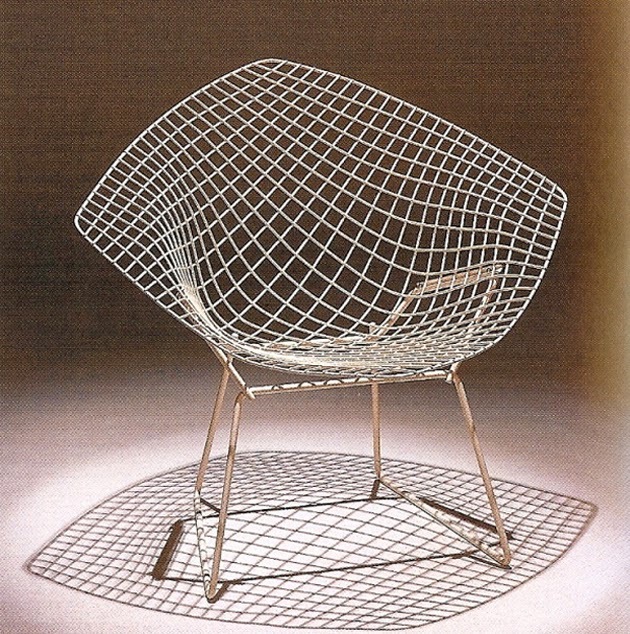 Harry Bertoia is the visionary sculptor whom everyone can thank for the unique wire guest chairs for reception areas and waiting rooms. When Bertoia joined Charles Eames in the late 40s, his designs became extremely popular with museums and art lovers all over the world. Today, fans of Bertoia's work love Woodstock Marketing's latest rendition. Their vintage wire Bertoia chair series, including the TheWho-LC-8300 chair, and Santana-CT2102A wire coffee table are classic furniture fan favorites! Back in the 1950s, it was furniture icon Shaw Walker who had all the visions for tomorrow. Back then, Shaw Walker chairs were the face of the future, but today, they are our stylish vision of the past. The cool 1950s chairs featured above have been refurbished with new fabrics and features to make them practical for the modern office, but originals would have been clad in colored leathers, fabrics, and vinyls for incredible style. If you love this look, but can't afford an original, no worries! Chairs like the 9663-52 Global Minotaur retro office drafting chair, and the 200-DK retro swivel chair by OFM offer similar stylings for old-school office appeal! The slang term "cool" was originally started in the 50s, but it wasn't until the 60s that "cool" became one of the most widespread words in the English language, and it was also the 60s that gave us so many of the coolest retro styles we know and love today! A quick internet search of 1960s chairs will lead you to pages of seating you'd swear was the hottest new thing on the market. For that, we can thank Charles and Ray Eames for being the geniuses behind timeless 1960s furniture design. Chairs like the ones featured above were just as popular in the 60s as they are in 2014. With segmented cushions, big buttons, a comfortable feel, and fabulous chrome, the look has remained ageless. For those in love with this style, the 11648 segmented cushion chair by Offices To Go is a great option! Much like 1960s chairs, chairs of the 70s have also made a comeback with the retro craze. These groovy seating solutions often boasted sharp curves and circular designs rather than lines and angles. The chairs were more about comfort during this era, with colorful cushions and unique appeal. The 70s era brought about the need for alternative guest seating, which is part of why visitors chairs like the 8622 Marche Guest Chair by Global are so popular. 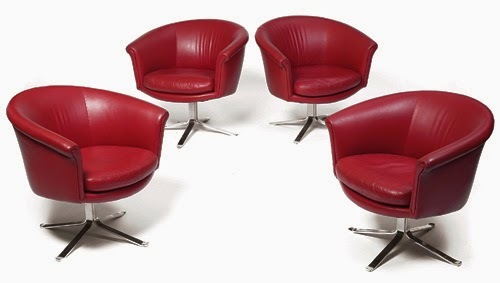 For those in search of a rock 'n roll appeal for their home or business office, retro Woodstock Marketing chairs offer all sorts of excellent 1970s styled models to get your groove on! The 1980s marked the beginning of the digital age, and the dawn of office life as we know it today. As a result, the chairs of this decade became very computer oriented. The beginning of the ergonomics movement was huge in the 80s and 90s, and we can thank these two decades for giving us the comfortable, highly adjustable chairs that keep us comfortable all day long. In the 1980s, Wilkahn chairs led the pack with innovative materials, sturdy design, and some of the first ergonomic features on the market. 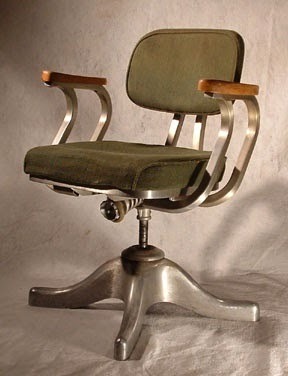 Today, fans of this style need only to shop top modern ergonomic chairs to benefit from fabulous 1980s chair innovation!